Q1. Who can open PPF Account? Q2. Where to Open PP Account? Q3. How to open PPF Account? Q4. What is the Contribution limit towards PPF account? Q5. How to make contribute online towards PPF? Q6. What is the PPF account Interest Rate? Q7. 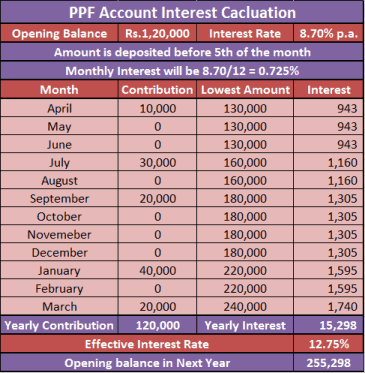 How PPF interest is calculated and compounded? Q8. What are the Tax Benefits of PPF Account? Q9. What is the duration or lock-in-period of PPF Account? Q10. H0w much Loan can be availed on PPF Account Balance? Q11. How to transfer PPF Account? Q12. How to withdraw or make premature withdrawal from PPF Account? Q13. 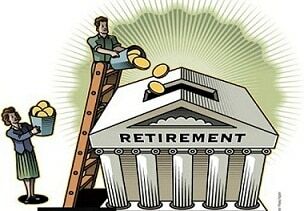 What is the difference between PPF and EPF? Public Provident Fund (PPF) is the most preferred tax-savings avenue considered for tax-planning under section 80C in India. It is a long-term debt scheme which is mostly seen as an imperative part of retirement corpus while sketching out financial plan. Fundamentally, Public Provident Fund is a small savings schemes instituted for the benefit of people employed either in the unorganized sector or are self-employed as they are not covered under the Employee Provident Fund Scheme. But what makes it more alluring is the fact that PPF is backed by the Central Government, which means Guaranteed Return with Zero Risk. Individual: An Individual either salaried or non-salaried can open account under PPF scheme for himself/herself, spouse and minor children but no joint account is allowed. Only one account can be open per person, this means at any point in your life, if it is found that a person is holding more than one PPF account on his/her own name, than only the account which was opened first would be continued and all other accounts would be discontinued. Further, only principal amount of discontinued accounts i.e. the contributed amount would be refunded without any interest. Individual who already have account under GPF (Government Provident Fund) and EPF (Employee Provident Fund) schemes can also open PPF account. Minor: Although, minor cannot open PPF account but a legal guardian i.e. biological father or mother or a person appointed by the court can open account in the name of minor. The guardian will be in charge for making periodic contributions and availing tax-benefits. In case the minor child attains majority (18 years) before the maturity of the account, then he himself can continue the account and avail tax-benefit. He will be required to submit a revised application form for opening the PPF account which is to be signed by him and attested by the guardian who was operating account before him or by any person known to the branch, to the Accounts Office. Remember that The Public Provident Fund Act, 1968 prohibits Grandfather or Grandmother to open account in the name of his/her grandchildren. Hindu Undivided Family (HUF): HUFs were allowed to open PPF account till 13th, May 2005 but thereafter they were made barred from opening account. Any account opened prior to that date shall be continued till the maturity but cannot be extended. NRIs: Non-Indian Resident cannot open account under PPF scheme. However, if a resident having PPF account subsequently becomes NRI, than he can continue the account till the maturity time 0f 15 year. No further extension is allowed and account needs to be liquidated. The contribution can be made either through NRE account or NRO account. A2. PPF account with an Initial Deposit of Rs.100 can be either opened in Post Offices or Nationalized Banks including few Private Banks. Currently, HDFC is not authorized to Open PPF Account. 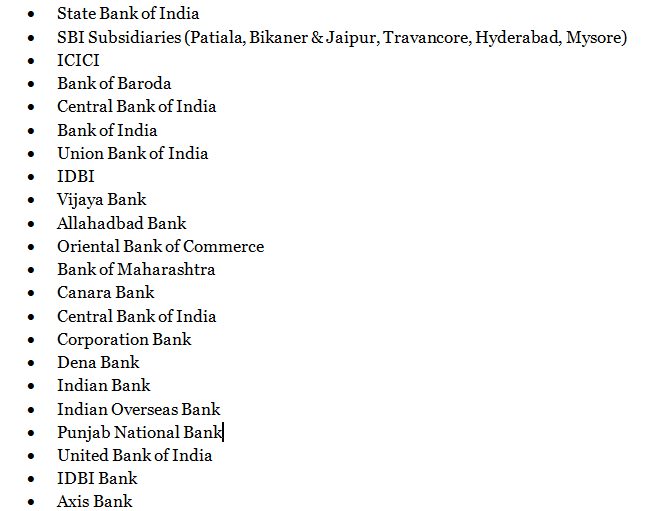 Also, not all the branches of the bank listed above are authorized to open PPF account. So, it is advisable to check with the bank before opening or transferring account. A3. Many banks insists on opening savings account prior to opening PPF account but no rule or clause in the Public Provident Fund Act, 1968 mandates it. Regarding Online PPF account, currently only two banks i.e. SBI and ICICI offers online access and deposition towards PPF Account. PPF accounts opened at postal departments do not offer online access facility yet. Form A is to be filled to open PPF account. 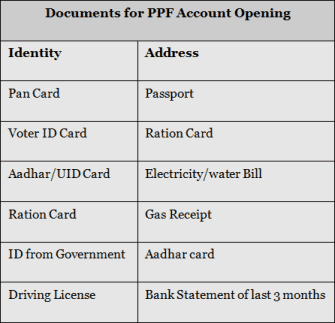 If you are planning to open PPF account at Post Office then click here to download Form A. If you are planning to go with banks than you have to visit bank or download it online from their respective sites as each bank has Form A with their name embossed on it. Generally, two working days are taken to open PPF account and Pass Book is issued to the account holder as soon as the account is opened. Pass book contains all the important details like PPF account number, branch name, holders name etc. ICICI bank which gives online access facility does not issue pass book but SBI does. Contribution towards PPF account cannot be made through the normal cash deposit slip. A separate slip called PPF Deposit Challan is to be filled for this purpose. The same challan is to be filled for subsequent contribution and do keep all the challans as same is required to claim tax benefit. A nominee (one or more person) is to be assigned by filling Form E, who will receive the PPF amount in case of death of the account holder. But no nomination can be made in the case of minor?s account. Any alteration/variation in the nominee is also allowed by filling Form F.
A4. The contribution made towards PPF account is an eligible deduction under section 80C of the Income Tax Act, 1961 of India. Sum of Rs.500 per financial year i.e. April to March is required to be deposited. No tax deduction is available if minimum deposit is not made in a year. The ceiling limit of PPF is same as of Section 80C thus for the assessment year 2015-16 (financial year 2014-15), it is Rs.1.50 lakhs per financial year. The deposit can be made either in installments or at once but the frequency/number of deposit in a year cannot be more than 12. Also, the deposit should be made in multiples of Rs.10. Contribution can be made in cash, cheque or via demand draft. The date of contribution in case of cheque and demand draft will be the date of clearance of instrument not the date of presenting the instrument. Failing to meet the criteria of minimum contribution will make PPF account discontinued and a penalty of Rs.50 will be payable for each default year along with the subscription arrears. For instance, if you have contributed Rs.800 in 1st year, Rs.200 in 2nd year, Rs.500 in 3rd year and Rs.400 in 4th year, than your account would be discontinued and can only be regularized by paying penalty of Rs.100 i.e. for 2nd and 4th year along with the subscription arrear of Rs.400. A5. The simplest form to contribute online is to make a third party transfer. You just need to add your PPF account as a beneficiary account under the third party transfer in your net banking account. Once the PPF account is linked as beneficiary account, you can make transfer. There is no need to have savings account and PPF account in the same bank to make online payment. If you have PPF account in ICICI and savings account in HDFC, then also you can follow the above method to contribute online towards PPF. A6. Update:?Starting from the current fiscal year i.e. 2016-17, Government has changed the norms of declaring interest rate on Public Provident Fund (PPF). Till now a single interest rate is declared for the whole year but now interest rate will be declared for each quarter?based on the previous 3-month yields on Government-Securities or G-Sec. The interest rate for every quarter will be declared on 15th of the preceding month such as for the quarter July to September, interest rate will be declared by 15th of June. For the first quarter starting from 3rd Quarter i.e. from 1st October to 31st December, 2016, interest rate is slashed down to 8.00% from 8.10%. For the Fiscal Year 2015-16 i.e. April 2015 to March 2016, PPF fetches interest at the rate of 8.70% per annum. 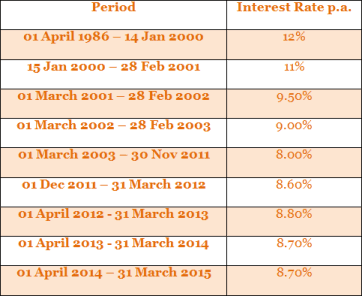 The interest rate is revised and notified each year by the Central Government in the month of March-April i.e. for the fiscal year 2016-17, the interest rate would be notified in March or April, 2016. Usually, the interest rate is fixed at 0.25 percent higher than the average yield of 10-year Government Bonds. Interest is calculated on monthly basis on the lowest balance between the end of 5th day and last day of month but the same is credited or reflected in your account at the year end. This means that if you deposit money in your PPF account after 5th of the month than no interest will be paid on the deposited amount for that month. For instance, if the opening account balance on 1st April is Rs.1 lakh and you deposit Rs.20,000 on 6th April than the interest for the month of April will only be calculated on Rs.1 lakh not on Rs.1,20,000. Read: How to maximize your interest earnings from PPF Account? So, it is highly advisable to invest on or before 5th of the month to maximize your earnings. A8. The tax benefits or zero tax on PPF account makes it more lucrative than any other investment schemes under section 80C. PPF falls under the tax treatment category of EEE i.e. Exempt, Exempt and Exempt. 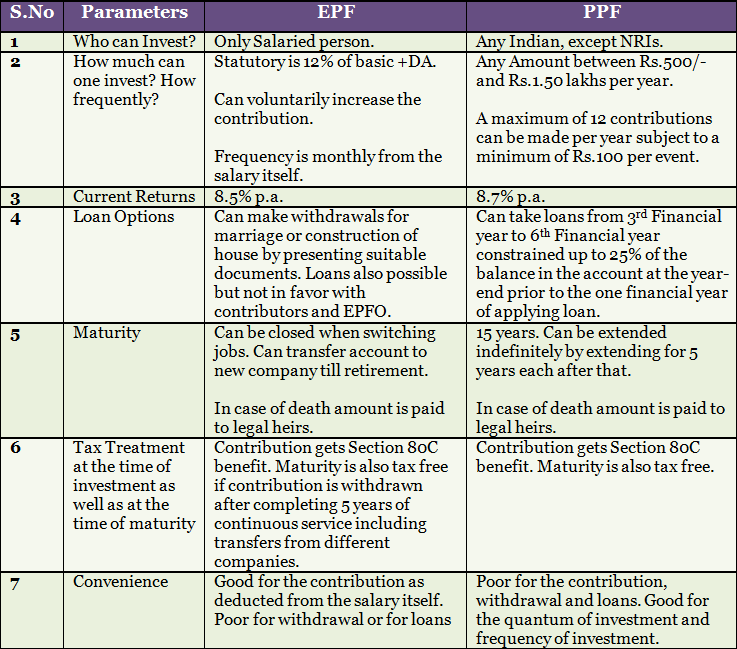 Let?s dive in the detail of tax exemption limits in PPF account. The amount contributed up to Rs.1.50 lakhs (threshold limit of Section 80C) is deductible from the gross total income under section 80C. This limit of Rs.1.50 lakhs includes the PPF contribution made towards self-account, spouse account and children account. So, investment exemption denotes the first ?E? of EEE. Accrued Interest credited in the account at the year-end is not required to be added to the income of the taxpayer and thus not exposed to income tax. Even, any amount earned from the PPF account of the minor child is also not required to be clubbed with the income of the parent. Exemption of the interest earned comes under Section 10 (11) and denotes the second ?E? of EEE. Only requirement is to show the interest income of PPF under the clause of Exempt Incomes while filing Income Tax Return. The amount received at the maturity is also tax-free. The benefit does not end here; the PPF is also exempt from the purview of wealth tax. Apply for extension for a within 1 year from the date of maturity. The extension is happen for a block of 5 years which can again be extended. This means one can extend his/her PPF account for unlimited number of times for a block 5 years. Continue account without any further deposit. In this case the account will continue to fetch you interest but no fresh deposit can be made. In case you forget to fill Form H after maturity of 15 years or after the maturity of extension period, by default option 2nd is applied to your account and your account is automatically extended for 5 years with no acceptance of any fresh deposit. The interest will continue to accrue. For instance, if you have your PPF account since 2001, than your first 15 years gets ended in 2016. Now, if you wish to continue your account for 5 years with fresh contribution than fill Form H with opting for option 1. In either case of forgetting to fill Form H or opted for option 2nd the PPF account gets extended for further block of 5 years i.e. till 2021 without any fresh deposit. At the time of extension you can withdraw up to 60% of your balance and let the rest amount placed in the account and continue earn interest. In case the account is extended for 5 years with no fresh contribution, the amount without any ceiling limit can be withdrawn once in a year and the remaining amount will continue to fetch interest. Loan against your PPF account balance is available from 3nd financial year to 6th financial year i.e. from the starting of 3rd financial year up to the end of 5th financial year. In simple words, Loan can be taken only after the completion of one financial year from the end of the year in which the account was opened and before the expiry of 5 financial years from the end of the year in which the account was opened. For instance, if you open your PPF account in December 2014, than the one year from the end of first fiscal year i.e. 31st March, 2015 would be 31st March, 2016. So you can avail loan from the 1st April, 2016. The 5th financial year up to which you can take loan would get over by 31st March, 2020. Thus loan can be taken from 1st April, 2016 to 31st March, 2020. Loan amount can?t exceed 25% of the balance in your account at the year-end prior to the one financial year of applying loan. So, if you apply for loan in January 2015, than you would get 25% of the closing balance in the year 2013 i.e. balance as on 31st March, 2013. The rate of interest on loan again PPF is lower than the personal loan rate. Currently, the interest rate is 2% more than the interest rate which you get on PPF account. So for the fiscal year 2014-15 the interest rate would be 8.7% + 2% i.e. 10.7% p.a. Also the benefit of opting loan is that no collateral security is required. The Loan amount should be repaid in 36 months i.e. 3 years. The repayment can be done either in a lump sum or monthly installments of 36 months. Once the entire repayment of principal is done, the interest shall be paid in two monthly installments. Second loan is only available once your first loan liability is completely met. However, in case you couldn?t pay the principal amount within prescribed limit of 36 months, the interest rate on the remaining loan amount would be hiked to 6% above the interest rate you receive on your PPF balance. Further, in case you have repaid the full principal amount but couldn?t pay the interest amount than the same shall be debited in your account. Application for loan is to be made in prescribed Form D. The form shall be accompanied by the details of the loan amount and repayment tenure. Information regarding loan taken earlier shall also be disclosed. Further, PPF passbook should also be furnished. Once you complete all the formalities, the loan will be disbursed within a week. It is a simple process with no fees or charges but it takes quite a long time i.e. around 3-4 weeks to complete. To initiate transfer process, simply approach the post office or bank where you have your PPF account and ask them for transfer form. 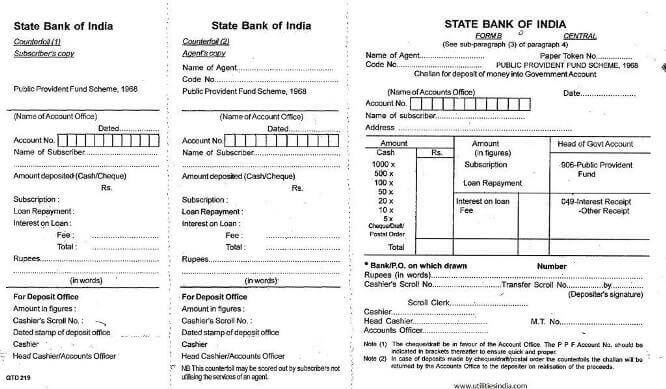 The SBI PPF transfer form is available online. Form SB 10 is used in case of transfer is happening from post office. The form requires you to mention the details of the bank or post office where you propose to transfer your PPF account. Once you submit the form or application to the bank or post office they will send the documents such as?the account opening application, nomination form, certified copy of the account, specimen signature etc. to the proposed bank branch address or post office address provided by the you, accompanied with a demand draft or cheque for the standing balance in your PPF account. Transferred PPF account is considered as a continuing account not a new account. It is advisable to check with your proposed bank or post office in 2-3 weeks. A12. No premature withdrawal of entire amount is allowed before the maturity. Only partial withdrawal is allowed. Partial withdrawal is allowed once in a year from the beginning of 7th financial year by filing Form C. Your PPF account should be 6 years old to make your first withdrawal. The withdrawal amount is restricted to the lower of 50% of the account balance at the end of 4th Financial Year, preceding the year in which the amount is withdrawn or 50% of the account balance at the end of the immediately preceding year. For Instance, if you open your account in the year 2000-2001, then you can make your first withdrawal after 2006-07 and the amount is restricted to the lower of 50% of the balance as on 31st March, 2003 or 31st March, 2006. Update: Government has granted some relaxation in PPF withdrawal rules. Unitl now, the Entire PPF account balance can be withdrawn either?at the time of maturity or at the time of death of the account holder, whichever is earlier. But now, full withdrawal can also be made after completion of 5 years only but for genuine reasons which are money needed for children’s higher education or for medical treatment. However, premature withdrawal will attract penalty of 1% less interest on all preceding years. Hence, withdrawing money may not be a good option unless there is a real urgency. The amount standing in the PPF account of the deceased is paid to the nominee or legal heirs. They need to fill Form G to make withdrawals. Nominee or Legal Heirs cannot continue the account of the deceased by making fresh contribution, they have to mandatorily withdraw the amount and close the account. In case the account balance exceeds Rs.1 lakh, then the legal heirs or nominee has to prove the identity to make withdrawal claims. In case you have extended your PPF account for a block of 5 years but without contribution than you can withdraw any amount once in a year and the remaining amount will earn interest. However, if you have extended PPF account with contribution than you can withdraw only 60% of the account balance standing at the beginning of the block of 5 years. Is premature closure of PPF Account possible? Yes, it is possible. The Government made this more flexible enough in order to make it popular. Government allows you to close your PPF account before the maturity period i.e. 15 years. Earlier also the account holders were allowed to close it pre-maturely, but only in case of death the account holder. But now it is more flexible and can be closed pre-maturely three reasons. Does deceased PPF account earn same interest as a live PPF account? On withdrawl of amount from PPF account by nominees etc. is tax levied on that withdrawn amount? If I open PPF account on my wife name ( she housewife and not earning) so Can I get 80/c benefit? Today I read your blog first time about all type of investment, its fantastic. Thanks for such crystal clear information. If I start a PPF account and for whatever reason I migrate to any other country – what will be the status of my PPF account – Will I be able to withdraw the entire amount, if so what will be the pre withdrawal fine ? IN CASE OF DIVORSE, HOW TO GET RETURN THIS INVESTMENT, EARLIER DONE IN THE NAME OF SPOUSE? I have a ppf account of my minor son in SBI.it got matured and my son is still minor.when I approached the bank the manager told me that you have to extend the account because your son is still minor. Only he can close the account. Is it like that. Please reply as soon as possible. Very very informative site. Extremely easy to understand. Only these kinds of sites are needed for any kind of information needed by any individual. how many PPF account opening at one person ? All explained in very simple way. And covered answers for all doubts. If i invest on monthly basis, will the entire amount be available for withdrawal after 15 years or it depends on the amount available for that month from the invested month. The amount contributed up to Rs.1.50 lakhs (threshold limit of Section 80C) is deductible from the gross total income under section 80C. Does this limit of Rs.1.50 lakhs includes the interest earned in March end or 1.50 excludes whatever interest we earn during the financial year? eg: last years’ interest : Rs 10000/- credited in my account on 31 March 2015… Should / can I deposit Rs 1,50,000 or 1,40,000? Need URGENT reply please …. Only the deposit amount is deductible. So if you deposit Rs.1,00,000 and get Rs.10,000 interest on 31st march, your total 80C deduction would be Rs.1,00,000 not Rs.1,10,000. very very important information provided by u.. All doubts are cleared about ppf & epf.. All procedure is given in very simple way for easily understand.. I am glad that you like the post. Keep visiting..
Great enlightenment about PPF. Keep it up & Than’Q’. PPF Scheme is explained very excellently. it is informative and covered all the points of scheme. Thanks for providing such articles which are very useful.